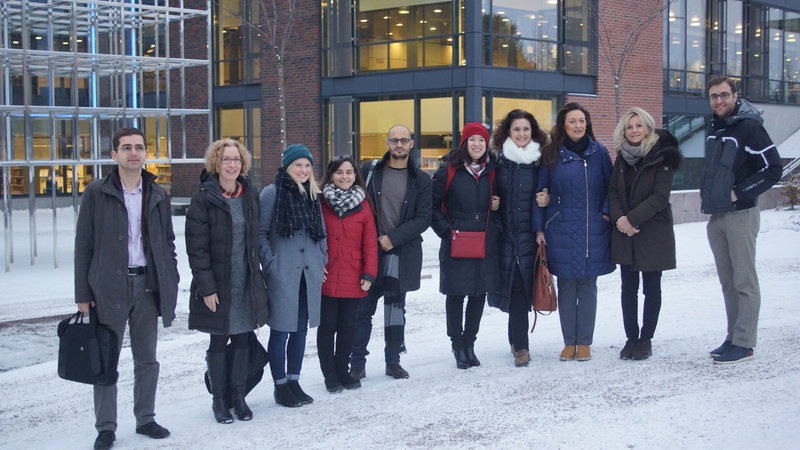 On the 26th and 27th of February, the Edul@b members Montse Guitert and Marc Romero traveled to Helsinki to attend the initial meeting of the Erasmus + European project DECODE (DEvelop COmpetences in Digital Era). In this project also participates the researcher of Edul@b Teresa Romeu. Once all the partners were presented, all the Intellectual Outputs were reviewed and the organizational issues decided in the first part of the meeting, the rest of the day and the second one were oriented to review and share among the partners the bases for the realisation of the national research in the participating countries; which will identify the training needs of teachers at various levels in the key competences of the twenty-first century, as well as establish a series of recommendations to both governments and institutions. During the meeting were presented the project website (www.decode-net.eu) and its Facebook page (https//www.facebook.com/decodeproject). The following March begins the research phase with various discussion groups and in-depth interviews with faculty and members of the administration, culminating in a series of national reports on “Training models and teaching methods for teachers. Teachers in the digital age” (IO2), where each partner country will identify the most interesting training models and teaching methods that will enable teachers to improve their digital competencies, as well as the incorporation of digital resources into their everyday teaching practices. The next meeting of the DECODE project will be held in the United Kingdom next June and will coincide with the first event of the project, which will invite entities and professionals of the United Kingdom interested in this subject, and in which will be presented the first products with the purpose of obtaining a first feedback.